We’re finally settled back at home after our best Origins yet! The week we spent in Columbus, OH was a whirlwind of meetings, events, and playing new and old games. We miss it already! We had two areas again this year: a booth in the Exhibit Hall with our store and a section of the Open Gaming Hall where we had our League. At our booth, you could frequently catch glimpses of a Kong visiting from New York. Doesn’t he look awesome in his IELLO tshirt? We also had quick demos of our most recent releases and a bunch of the new version of King of Tokyo for sale. In our Organized Play area, the IELLO League was constantly a hub of energy and gaming. This picture is from Wednesday, the calmest day. Note: the nicely aligned stacks of papers and buttons. That didn’t last long, but we had a great time with everyone who stopped by and played! Everyone who participated walked away with an armful of promos and a well-stamped player card as a souvenir! 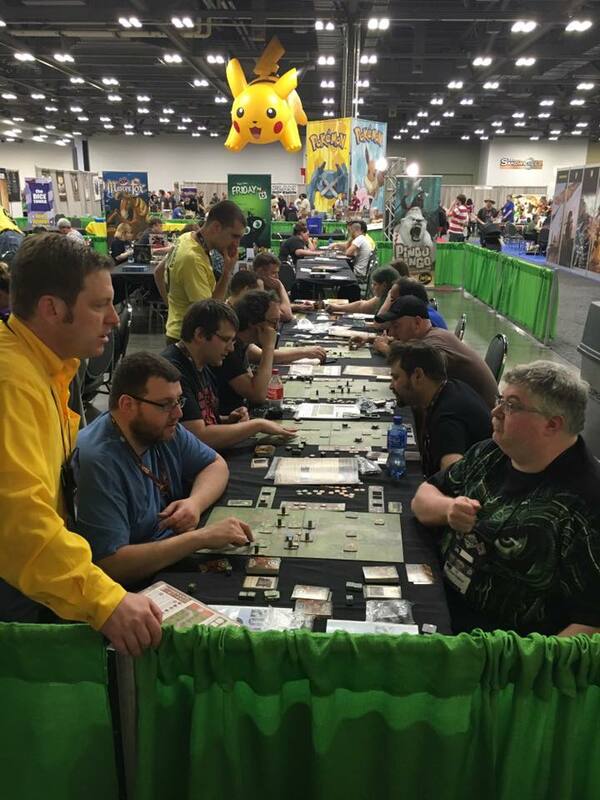 We also hosted the Heroes of Normandie Nationals at Origins this year. Clem, one of the designers, was our guest and had signings scheduled on Saturday. We were happy to host the Nationals at Origins this year since the show started as a place for war gamers to gather! We taught Heroes to many people during the convention, and a few of them left the show with their very own copy of the game! Three of our games were nominated for Origins Awards this year: Medieval Academy (Best Card Game), Welcome to the Dungeon (Best Card Game), and Me Want Cookies! (Best Family Game). They were up against worthy contestants, and while we didn’t come home with any trophies, we are honored for the nomination. Sunday was the last day and while it was a long, busy show, the team still managed to keep smiles on their faces! 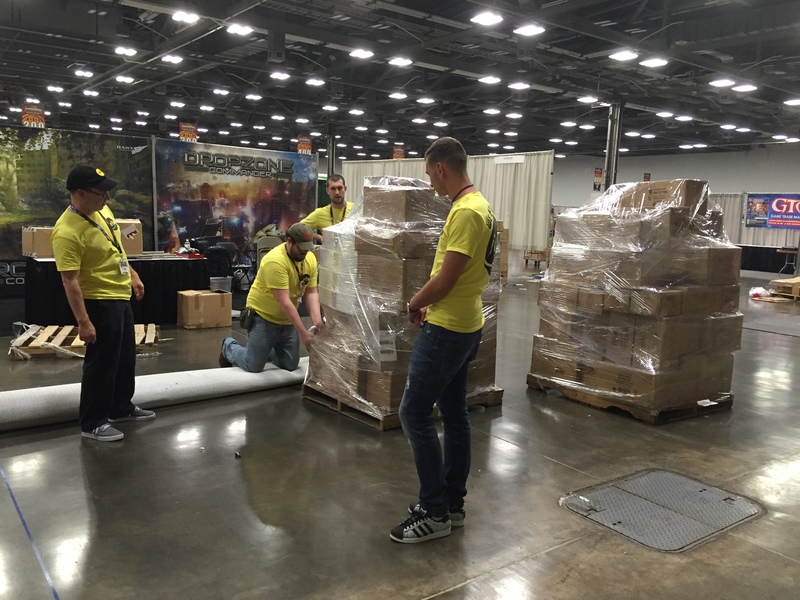 Our awesome demo team helped with break down and everything was packed up for Gen Con before dinner time! We are already excited for next year and are brain storming ways to make our booths bigger and better for our fans! If you weren’t able to make it to Origins, we hope to see you soon at Gen Con in August! We’ve been getting a lot of questions about our events at Gen Con (register here! ), so I’ve put together a schedule and FAQ to help answer some of those questions. Where is the IELLO League from last year? This year we were unable to have our own Organized Play room, so all of our events will be in the Event Hall at Gen Con. This means we couldn’t keep the IELLO League format that was so popular last year. We tried to keep the same idea with the Showcases, where every time you play a game, you get prizes just for playing (no winning required!). This time though, you’ll receive a Player Card when you sign up that has the logo of each game we have available to play in the Exhibit and Event Hall. Each time you play a game, we’ll stamp your card and give you a scratch-off ticket (instead of an envelope). The ticket will determine what prize you receive (from an assortment of promos, prints, and stuff); you can receive 4 of these tickets each day. We’ll also have special objectives for you to complete; you can complete one of these per day. We’ll keep track of how many stamps you get each day by having a different color for each day. Can I use the Player Card for multiple Showcases? Yes! You can bring the Player Card with you to both IELLO locations and get stamped. Are the Showcases set up for demos or for full play-throughs of games? During the Showcase, you can play as long as you’d like for the duration of the event. Volunteers will be there to teach and help with rules, but the Showcases are an organized space for you to play. We have three Levels of prizes that you can earn from participating in the Showcases. Level 1 has an assortment of promos and prints from older games (Steam Park, Zombie 15′, Three Little Pigs, etc.). 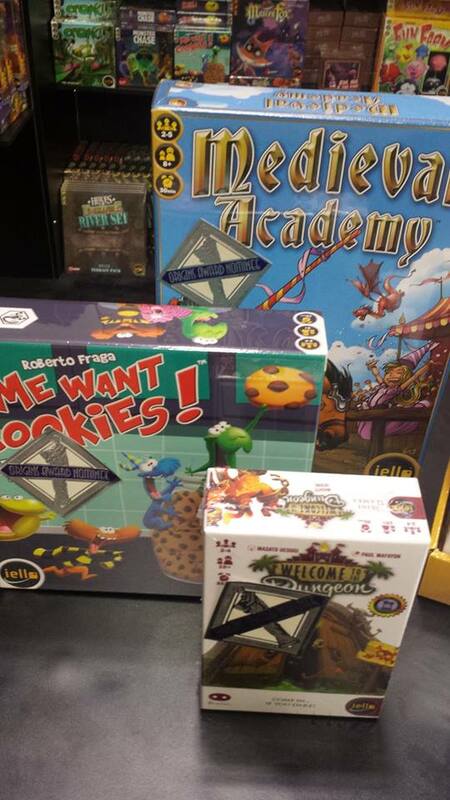 Level 2 has an assortment of promos from our most recent games (Happy Pigs, Big Book of Madness, Medieval Academy, etc.). Level 3, which you get by completing special objectives, has King of Tokyo characters, The Broken Token inserts, rare promos, signed artwork, and more! What happens if I reach my 4 daily stamps? You can continue playing games and get prints or buttons – your choice! If you have more questions, please send an email to info@iellogames.com and we’ll add them to the FAQ! Looking forward to seeing you at Gen Con! Origins is four weeks away, and we’re getting excited! Promos and prizes are packed up, our games are on order, and our demo team is all organized. Since Event Registration is open, we wanted to share details about the events and provide a schedule of all of our events so you can plan your day in advance. We have the IELLO League running from 1pm-6pm. If you don’t know what it is, check out this post that explains the concept. This year it’s working close to the same way, except you’ll get a scratch-off ticket instead of an envelope. Yay, less mess! 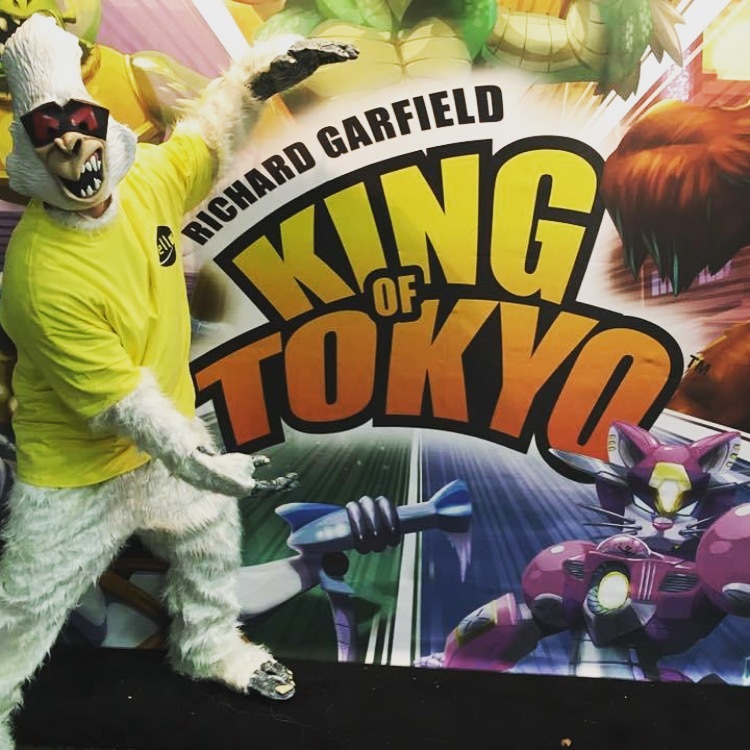 Giant King of Tokyo will be out for two hours, from 3pm-5pm. All participants will receive a The Horde promo for King of Tokyo, and the winner will receive a Space Penguin. Exciting! We’ll have a Sapiens Tournament from 2pm-5pm. All participants will receive the Mountain AND Double promo tiles, and the winner will receive a free copy of the game. Since we’re having the Heroes of Normandie Nationals at Origins this year, we’re having an official demo of the game every day leading up to the event. At 4pm, demo a scenario guided by the designer of the Heroes Tactical System! All participants will get the Bill & Siegfried promo punchboard. We open at 10am with the IELLO League in full swing. Giant King of Tokyo and a King of Tokyo Tournament also start then. All participants of the tournament will receive a promo card pack and the winner will receive a Space Penguin and an invitation to the King of Tokyo Nationals at Gen Con! At 11am, we’ll have our Shadows over Normandie Demo, guided by the designer. 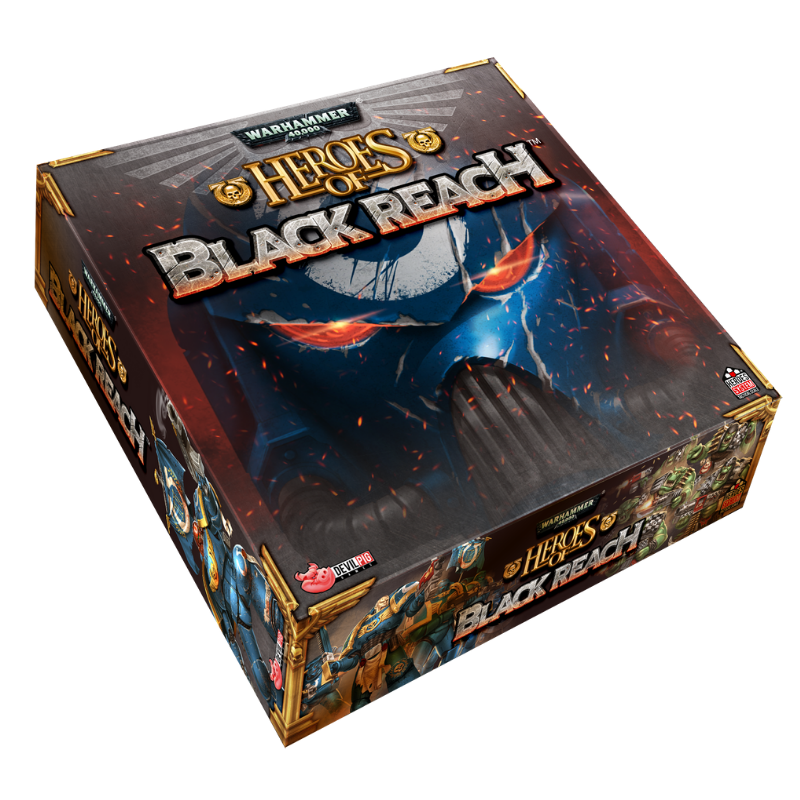 All participants will receive the Game Store promo punchboard. At 2pm, we’ll have a Medieval Academy Tournament. All participants will get the Magic & Gallantry alternate tile, and the winner will receive a free copy of the game. At 3pm, we’ll have a King of New York Tournament. 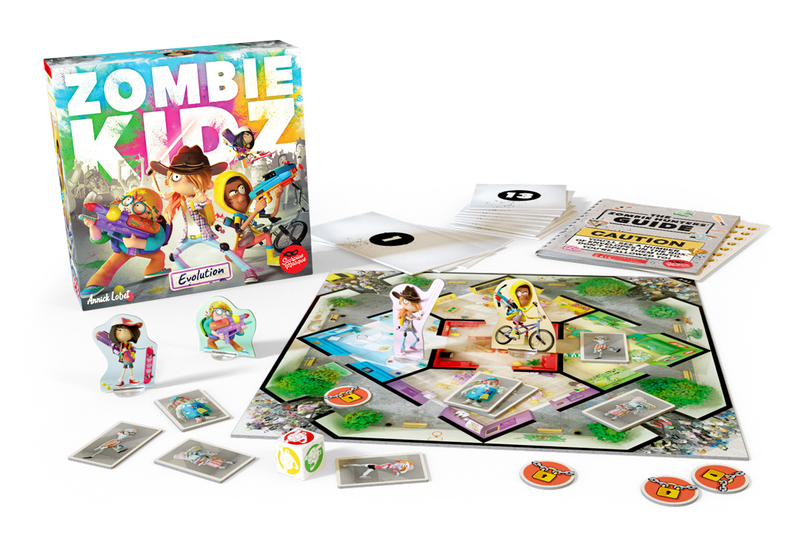 All participants will get a promo card pack, and the winner will receive an Alpha Zombie and an invitation to the King of New York Nationals at Gen Con. At 4pm, we’ll close out the day with a Biblios Tournament. The winner will receive a free copy of the game. The IELLO League and Giant King of Tokyo start at 10am again, along with a King of New York Tournament. At 11am, we’ll have a Happy Pigs Demo, where all participants will get the Penguin promo. At 1pm, we’ll have a Welcome to the Dungeon Tournament where the winner will receive a free copy of the game. At 2pm, we’ll have a King of Tokyo Tournament, and then at 3pm, we’ll have a Sea of Clouds Demo, where each participant will get the Kawaii promo card pack. At 4pm, we’ll end the day with another designer-guided Heroes of Normandie Demo. The IELLO League and Giant King of Tokyo start at 10am, but most importantly, the Heroes of Normandie Nationals begin as well. Play scenarios specially designed for Origins or die trying! All participants will receive an assortment of HoN prizes, and the winner will receive a free copy of every HoN product. While this is going out, we’ll have a King of Tokyo Tournament at 12pm and a King of New York Tournament at 2pm. You can try your hand at The Big Book of Madness Challenge at 1pm. All participants gets the Mime promo, and the fastest (or surviving) team will get the Golem promo as well. At 3pm, we’ll have a Happy Pigs Tournament. All participants get the Duck promo, and the winner will receive a free copy of the game. At the same time, we’ll also have a Sea of Clouds Tournament. All participants will get a Captain promo board, and the winner will receive a free copy of the game. We’ll end the convention with just a small selection of low-key events. The IELLO League and Giant King of Tokyo will start at 10am. There will be a King of Tokyo Tournament at 11am, and a King of New York Tournament at 12pm. Then we pack up our booth and catch up on sleep after an exciting week of Origins! 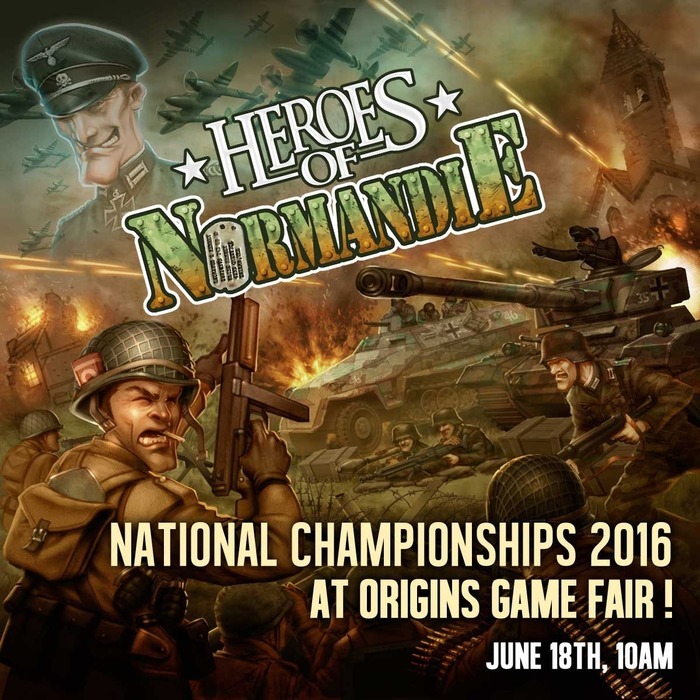 IELLO and Devil Pig Games are pleased to announce that the 2016 Heroes of Normandie National Championships will be held at the Origins Game Fair in Columbus, Ohio on June 18, 2016 at 10:00am. Heroes of Normandie is a WWII wargame focused on the Hollywood version of historical events during this period. The National Championship is an open event and all competitors are welcome to attend. Participants should be familiar with the basic rules of Heroes of Normandie and will be presented with novel scenarios made specifically for the Nationals competition. Game materials are provided to all players and prizes will be awarded to the top winners. A valid badge to the Origins Game Fair and a ticket for the Heroes of Normandie National Championship are required for entry. This event is not for the weak of heart! The IELLO team is back home and settled down again after the excitement of Gen Con 2015! We had been planning so many exciting events, releases, and previews in the weeks leading up, that now it feels almost weird to not have 5 million things to do at once! Never fear though, we’re already planning things for next year’s Gen Con – it’ll be even better! 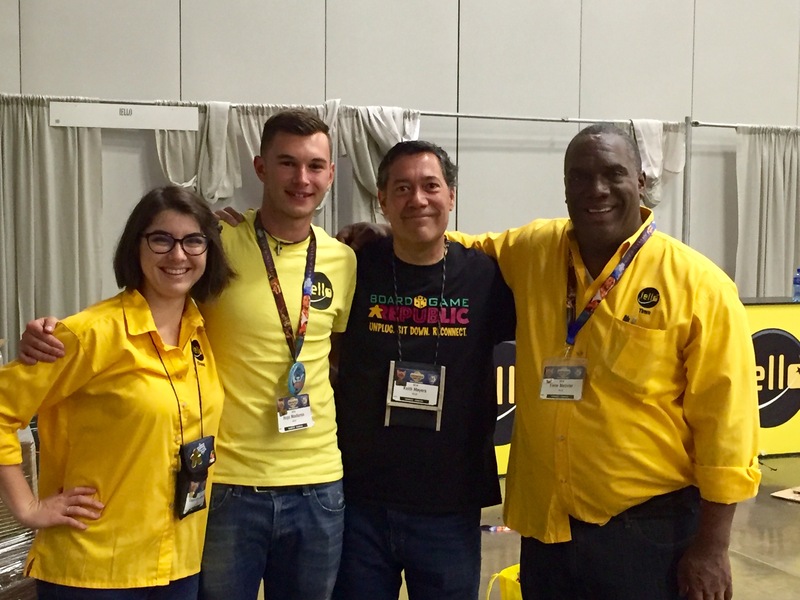 For those of you participating in Gen Can’t, and for those of you who would like to reminisce on all the good times, here’s a recap of what the IELLO team was up to! We had a huge team of volunteers (31 people! ), some veterans some newbies, that traveled to Indy to help us out. Tuesday night and all of Wednesday were spent making sure everyone was up to speed on our demo code: Make it fun for them, make it fun for you! Of course we also spent a lot of time playing games to make sure rules were well-known and tips and tricks were shared. Everyone did a fantastic job, and we hope their bright yellow shirts made them an easy spot and every question you asked was answered with a smile! We had two locations at Gen Con: a booth in the Exhibit Hall and our own private room for Organized Play. The Exhibit Hall was a chaotic mess of gamers, merchants, and artists all buzzing around trying to do as many things as possible. Our booth boasted Larger-than-average King of New York, Giant Welcome to the Dungeon, and a detailed diorama of Zombie 15′s scenario 5. We also had demos going nonstop of our upcoming The Big Book of Madness (not the final version, but still beautiful! ), Sapiens, and Little Red Riding Hood, along with some of our other popular games. Our main shop was also a buzzing center of activity, as we had our newly released Medieval Academy, Kabuki, Dungeon Fighter expansions, and the reprint of Welcome to the Dungeon available for purchase. We showed our appreciation for everyone who made a purchase by supplying the corresponding promo to games that had them. Thanks to you all! We also had an area reserved for Heroes of Normandie demos as we hosted one of the designers, Clem (pictured left), and the artist, Alex (pictured right) as our guests. They had a great time meeting their fans and sharing tips for gameplay. They also enjoyed posing with War Game enthusiasts – check out this incredible Red Devil get-up! Our Organized Play room was a hub of activity the entire convention. Here we ran full-length play-throughs of our games, instead of the “speed dating” demos we had in the Exhibit Hall. 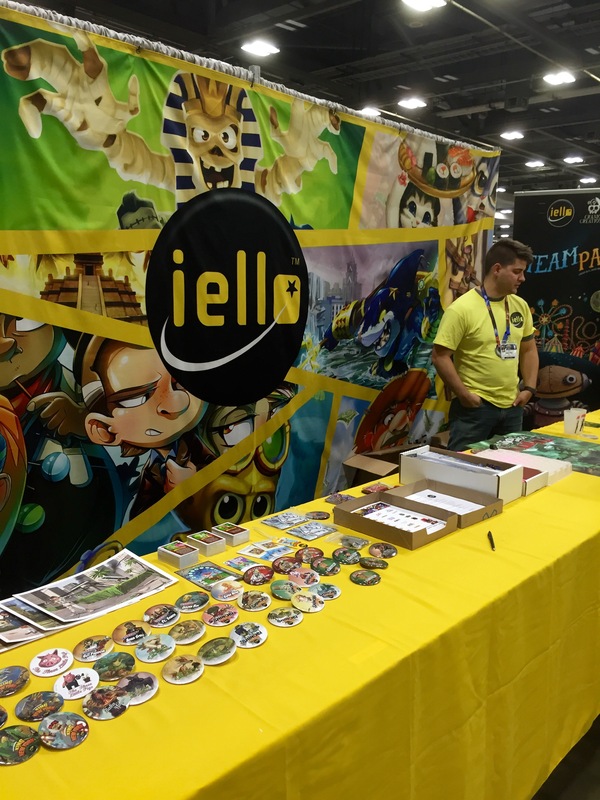 We also ran our IELLO League program that we introduced at Origins, with improvements! We didn’t expect it to be so popular – on Friday we had over 550 unique people participate in the program! By Sunday pickings were slim for prizes, but buttons were plentiful! Thankfully you all understood and were glad to wear IELLO swag on your lanyards, backpacks, shirts, jackets – pretty much everywhere! In here you could find Giant King of Tokyo and a second copy of Larger-than-average King of New York, as well as our scheduled demos and hourly tournaments. Pictured here are our newly crowned National Champions for, from left to right, King of New York, Heroes of Normandie, and King of Tokyo! These guys played long and hard to stake their claim to the trophies, and they certainly deserve their respective titles! Look at those proud smiles! We’re proud of you too! On Sunday, Giant King of Tokyo made its way outside to a shaded stage surrounded by food trucks around lunchtime. A change of atmosphere livened things up (who knew it could be even more exciting??) and IELLO goodies were distributed to passerby.